That’s how it was – how it may still be – for the prisoners at Guantánamo. As the prison enters its 15th year of operation, there are 107 people still there, and most are held without charge. In the first year of the island prison, detainees were denied regular use of a pen and paper. They wrote short poems on Styrofoam cups, using pebbles or tracing out words with dabs of toothpaste. Later, they were given regular writing materials. For the most part, we don’t see their writing. In the case of detainees like Mustafa al Hawsawi, the government has deemed their memories of torture, their minds, “classified.” What we have seen – what we have read and recited – is beautiful yet despairing, mournful but inspiring. 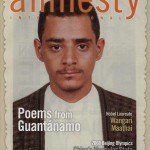 These poems, along with 19 others, were published in 2007 following efforts by Guantanamo lawyers. Jumah al Dossari held at Guantánamo January 2002 to 2007. Abdulla Thani Faris al Anaz held at Guantánamo from 2002 to 2007. Excerpt. Two years my eyes untouched by kohl. For grazing herds that leave well fed. When you hear the voice of my anguished soul. Kiss him on his foreheard, for he is my father. I am sorry, my brother. And iron is circling the place where I sleep. That I cannot help the elderly or the widow or the little child. Do not weigh the death of a man as a sign of defeat. And failing to stand by your beliefs. Excerpted from Poems from Guantánamo, published by University of Iowa press. On Monday, January 11, take action. 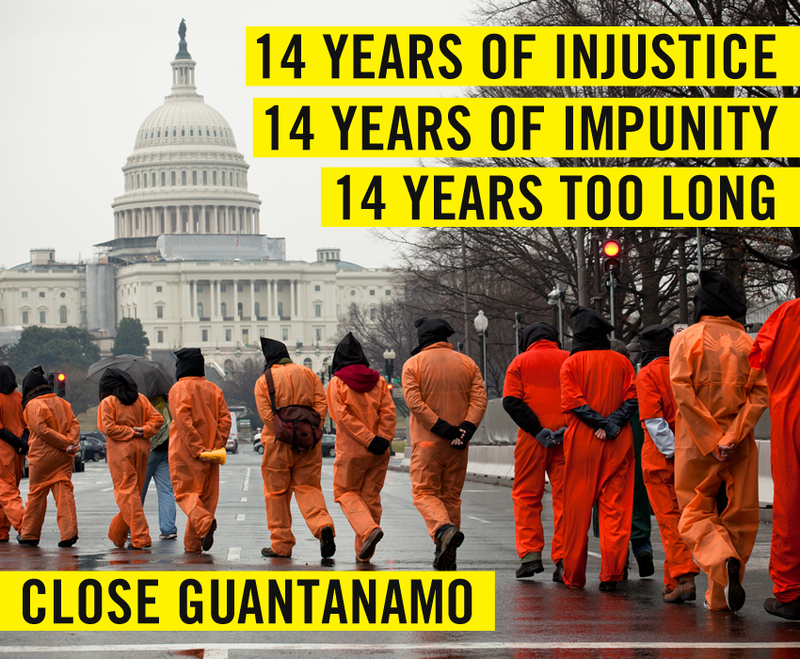 Sign the global petition to tell President Obama to close Guantanamo and end indefinite detention before he leaves office. 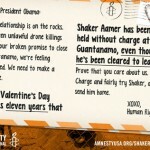 This entry was posted in Music and the Arts, Security and Human Rights, Torture, USA and tagged #closeguantanamo, guantanamo, poetry, President Obama, security and human rights, torture, united states by Naureen Shah. Bookmark the permalink.